As the owner of a retail store - whether brick-and-mortar or ecommerce - there’s nothing more exciting than seeing a customer head to the checkout area with a bunch of stuff in their cart. Sure, it’s nice and all when a customer purchases one of your items. But, as you surely know, it takes a lot of time, effort, and money to get that customer to even check out your store in the first place - let alone actually make a purchase. At any rate, it really doesn’t take a rocket scientist to figure out that the more money you can make per individual transaction, the better off your business will be. Figuring out how to increase the chances that your customers spend more per transaction, on the other hand, might not be as simple. In this article, we’re going to look at some of the most effective ways of increasing your ecommerce business’ Average Order Value (AOV). But first, let’s hammer out exactly what AOV is, and why working to improve it can be hugely beneficial to your company. Average Order Value is, well...exactly what you think it is: the average amount of money your customers spend in a single purchase instance. To calculate AOV, you simply divide your total revenues by the number of individual purchases made by your customers. A simple example: If ten people visit your store, and you make a total of $1,000 from these ten purchases, your AOV is $100. First of all, AOV can provide supplemental information when assessing conversion rate. Conversion rate, of course, measures the percentage of visitors to your store who end up making a purchase. However, it doesn’t tell you anything about the purchases they made (i.e., did they buy $1,000 worth of items, or $50?). Analyzed alongside conversion rate, AOV will tell you whether or not these conversions were actually profitable. Revenue per visitor is another important metric, which can best be described as a cross between conversion rate and AOV. Essentially, revenue per visitor determines how much revenue you bring in whenever someone checks out your online store. Whereas AOV only takes into consideration engagements in which a purchase was made, RPV also considers those who visited but did not make a purchase. Another metric related to AOV is cost per sale: the total amount of money it costs your company (in marketing, advertising, production, etc.) to make a single sale. CPS is determined by dividing the total cost of running your business by the total amount of revenue generated by sales. In general, the higher your AOV, the lower your CPS will inherently be. What Does Average Order Value Tell You? Average Order Value tells you how much money your customers are spending each time they make a purchase from your store. Now the question is: What does that information tell you? For starters, AOV generally tells you whether or not you’re doing a good job of pressing your customers’ buying buttons. On the other hand, if you walk into a hardware store looking for a simple hand saw, that’s probably all you’re going to end up purchasing. We’ll talk much more about this in a bit, but for now we’ll just say that your AOV gives you a good idea of the effectiveness of your marketing campaigns, pricing strategies, store/site layout, and more. If you have the bandwidth to do so, you should analyze and assess your AOV as often as possible - perhaps even daily. If you don’t have the capacity to keep up to date with AOV in real time, you should at least analyze changes in this metric on a monthly basis. Additionally, you should keep a close eye on your AOV whenever you make any customer-facing changes to your store (such as the marketing, pricing, and layout strategies mentioned above). By monitoring how a single change affects your customers’ propensity to spend more money, you’ll be better equipped to make more strategic improvements to your initiatives moving forward. It’s important to note, though, that changes in AOV might not explain exactly what went right or wrong with a given campaign (i.e., the positive or negative change will only tell you whether or not the change made a difference). That being said, once you notice changes in your AOV, you can then work to dig into the exact reason for such a change. Once more, improving your AOV is clearly good for business. As we alluded to earlier, it inherently costs your company at least some amount of time, money, and energy to generate each sale you make. By getting your customers to buy more during each of these sales, your cost of doing business will decrease overall. Going along with this, the less you spend on current initiatives to acquire and sell to customers, the more you have to increase these initiatives. In other words, the higher your AOV, the further you’ll be able to stretch your budget for marketing, outreach and more. Now, without further ado, let’s look at some of the most effective ways of increasing your AOV. Now that we have a clear understanding of the far-reaching effects increasing your AOV can have on your business, let’s check out some of the best ways to actually do so. We’ve recently gone in-depth regarding best practices for upselling, but it’s worth discussing here, as well. Essentially, upselling is the process of showcasing a more valuable item to customers once they’ve shown interest in a given product. Perhaps the most well-known example of an upsell is McDonald’s “Super-Size” offer, in which the customer receives an additional amount of soda and fries for a relatively small increase in price. Other examples include offering an iPhone with 128GB of space (as opposed to the 64GB version), or an upgraded car insurance policy that includes coverage for flood and fire. For ecommerce companies, one of the most effective ways to upsell customers is to showcase higher-quality products either on a given product page or during checkout. The above screenshot is from the product page of a $186 Chromebook. As you can see, each of these additional items is listed for more than this baseline price. Of course, the quality of these suggested products is higher than the original offering, as well. Now, your best bet when offering products of higher quality is to not go overboard; if a customer is looking to spend $50 on an item, they probably won’t be willing to drop $200 on a higher-quality product. They might, however, be willing to spend an additional $10 or so. Additionally, when attempting to make an upsell, you want to do so in an unobtrusive way. Don’t “push” the upsell, or offer a product with features your customer doesn’t care about. As we said earlier, your main focus should be on providing added value to your customers - not fleecing them out of extra cash. Another tactic we’ve recently discussed is cross-selling. Often referred to in the same breath as upselling, cross-selling is the process of offering a customer supplemental products in addition to their initial purchase. To use another example from the fast-food world, the phrase “Do you want fries with that?” is perhaps the most well-known cross-sell in the service industry. Thinking about it, this cross-sell offer is so popular that it’s essentially become a baseline offer itself. The logic behind such a cross-sell is pretty obvious: Cabela’s knows that in order to actually use a fishing reel, the customer is also going to need a fishing rod, as well. It’s also worth noticing the first item: a rather inexpensive cover the customer can use to keep their new reel from getting dinged up on their next fishing trip. These suggested items are listed on a similar Zoom lure, as Cabela’s knows fishermen typically use more than one color and type of lure - and that they tend to need more than one of each. Basically, it’s all but assumed the customer will end up purchasing more lures as some point - Cabela’s just makes it easier for them to do so right away. Another strategy that’s similar to up- and cross-selling is offering package deals at a discounted price. The main difference between upsells/cross-sells and bundles, though, is that upsells and cross-sells are sort of done “on the fly,” whereas bundles are more universally set in stone. To clarify, say a customer walks into GameStop looking to purchase a 500GB PS4. The store’s representative might try to upsell them on the 1TB version, or they might try to cross-sell them on an extra controller or a number of different games. Again, this is done on a customer-to-customer basis, depending on an individual’s expressed needs. To create attractive bundle offers, you’ll want to analyze your customers’ purchase history to determine which items are often purchased within the same transaction. You’ll also want to take note of currently-trending products that complement larger “hot-ticket” items. Again, one thing to avoid is forcing your customers to purchase bundles that they don’t need. Using the above example, if a customer has no interest in Call of Duty, but GameStop didn’t offer a PS4 sans bundle, they’d simply go elsewhere to purchase the system. Okay, now we’re getting into the ecommerce-specific techniques. As the owner of a virtual storefront, one of the most disheartening things to experience is seeing a potential customer navigate away from your site after loading up their shopping cart - but before they actually make a purchase. However, the advantage of ecommerce over brick-and-mortar stores, in this aspect, is that it’s much easier to contact customers who have abandoned their cart at the last minute (as long as they were logged into their account at the time). Using the contact information they’ve provided you, you can then reach out to remind them that their shopping cart is still full. Typically, you want to automate the sending of this email so it occurs a day or so after the fact. In addition to a friendly, unobtrusive reminder, you can also provide them with a discount on their purchase in order to nudge them even closer to converting. Recovering an abandoned cart is good for your business before you even take AOV into consideration. While not necessarily a given, the addition of a discount may encourage those who originally abandoned their carts to actually make additional purchases upon venturing back to your online store - increasing your overall AOV in the process. Wouldn’t it be great if you could guarantee your customers would spend at least a specific amount of money each time they made a purchase from your store? While you can’t necessarily guarantee it, you can increase the chances of them reaching your sought-after threshold by providing incentives for doing so. Here, we’ll talk about a few different strategies to use with regard to spending thresholds. First, let’s talk discount thresholds. In this example, Kohl’s gives a bigger discount to shoppers whose purchases total more than $100. While those who don’t reach this threshold also receive a substantial discount, the larger discount is great incentive for those whose total is close to $100, but isn’t quite there. From the customer’s perspective, buying $110 worth of items for $88 - when they originally planned on spending $80 - is totally worth the extra $8. From Kohl’s perspective, their customer spent $8 more than they were originally going to. Similar to the discount offer, most customers would gladly spend an extra $10 to receive free shipping (in addition to the “extra” item purchased) - especially when their other option is to spend $8.95 simply to have their original order delivered as usual. Finally, you might also choose to offer discounts not on the amount your customers spend, but on the volume of items they purchase. 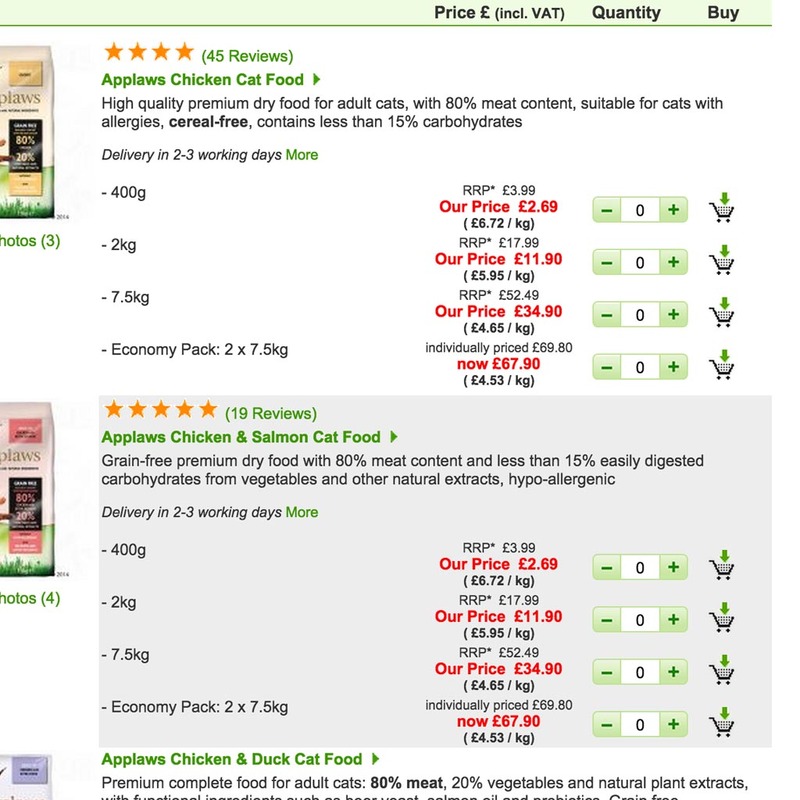 In the screenshot above, the supplier showcases the amount of money a customer saves by purchasing a higher volume of cat food within a single transaction. In this example, the higher volume is offered in a single, larger package; you could also offer a similar discount when customers purchase multiples of a single product (e.g., purchasing five reams of printer paper instead of one). Won’t I be losing money by offering these discounts and freebies? Doesn’t that defeat the purpose of increasing AOV? Yes, offering these discounts certainly can be problematic - if done arbitrarily. If, for example, you offer free shipping on purchases of over $50 - and your customers always end up purchasing $50 or more worth of items - you’re going to be eating the cost of shipping for every single transaction; obviously, this will eat a gigantic hole into your profit margin. The trick, then, is to assess your current AOV and analyze your customers’ purchasing habits, then use this information to set your threshold. Typically, you’d want to set your threshold slightly higher than your sought-after AOV. In doing so, you’ll find a “happy-medium” in which your customers are spending more and getting more in return - but you’re still not losing out on the deal, either. No matter which of the previous techniques you choose to use at a given time, you should make sure your customers know such deals won’t be around forever. For one thing, you’ll create a sense of urgency among your customers. If, for example, they know they only have two days left to take advantage of a free shipping offer on purchases over $50, they’ll be more likely to load up their cart and “pull the trigger,” so to speak - mitigating instances of abandoned carts and increasing AOV in one fell swoop. Additionally, by advertising specific deals for a limited time only, you give yourself the freedom to tweak and change the offers over time as you see fit. For instance, you might offer free shipping on purchases of over $50 for a week, then change the offer to free shipping on purchases of over $75. After testing a number of different offers, you can then look back on how each performed to determine which works best in terms of increasing AOV and overall profits. Now, depending on the information you glean after testing changes to your offers, you might decide to adopt some of these deals as policy (e.g., offering 10% off purchases of over $200). You can certainly do so (in turn developing a USP for your brand in the process) - but you should be absolutely sure that the offer will be massively profitable for your business in the long run. One last thing we’ll mention is the importance of getting your customer to look forward to their next purchase - before they’ve even made this one. There are a number of tried-and-true techniques for doing so - such as offering discounts on a customer’s next purchase after having spent a certain amount during the initial transaction, or implementing a loyalty program where customers collect points based on how much they spend. In terms of increasing AOV, such tactics are similar to setting purchase thresholds, in that your customers will happily spend a little more if they end up receiving a ton of value in the process. In addition to increasing AOV, though, such future offers also keep your customers “on the hook” for at least one more transaction. Yes, you’ll be giving them something for a discount (or for free) the next time they come to you - but this next time will also give you an additional opportunity to up- or cross-sell them on additional items, as well. Because they’ll already be on your site, and will have already saved money before even making the next purchase, they’ll almost certainly be okay with spending a bit more on something new. The more you can get your customers to spend during each purchasing instance, the better off you’ll be. On the surface of things, getting your customers to spend more during a given transaction brings more immediate revenue in, and increases their LTV in one fell swoop. But it also means your average cost per sale will inherently decrease, as well. Again, by making more money upfront, you end up spending less getting your customers to come back in the future.